Once upon a time, there was a bear which was kept in a bar in a big city. One night, one of the customers got very drunk and approached the bear. For a joke, he gave his alcohol to the bear. The bear sniffed it, then turned away from it. Other customers also started to give the bear different kinds of drink, but the bear wasn’t interested in any of them. One night after that, a man from Kochi came into the bar. When he heard about the interesting story about the bear, he remembered he had a bottle of alcohol which was produced in his home town. He put the bottle in front of the bear as the other customer has done. At first, the bear gave one glance at it and sniffed it slightly. His reaction was no different from other times, but in the next moment, things were totally different. After sniffing the drink, the bear tasted it a little bit. Suddenly, the bear took a hold the bottle and started to gulp it down! All people who were drinking in the bar were surprised about it. At last, the bear finished drinking and fell asleep. The next morning, the bear had bad hangover. The amazing alcohol’s name was a Japanese shōchū called “Dabada Hiburi (ダバダ火振り)”. A comic book which introduced many kinds of alcohol told this interesting story about Dabada-hiburi. My father bought the comic long time ago, and I happened to read the comic by chance. It made such an impression on me though I was just a junior high school student and not interested in alcohol at all. The source of this name is the place name ”Daba (駄場)” which is a small lodge in the mountain. Local people used to gather at this lodge, so it implies coexistence with nature. “Hiburi (火振り) refers to the traditional way of catching ayu or sweetfish, in this area. Dabada is really famous in Japan, so I nervously went to meet the president. I enjoyed the natural beauty of the Shimanto river area on the way to the Mutemuka (無手無冠) company office. Contrary to my expectations, the president , Hiroaki Yamamoto, and the staff of Mutemuka welcome me. If I describe his image with just one phrase, “田舎のおんちゃん (Rural father)”. He reminded me of my good old days. About 30 years ago, Shimanto city faced some serious problems. One of the problems is that there are a lot of steep land and not so much flat land for agriculture because of mountains occupy 92% in this place. Fortunately, however, they found out that chestnut is able to grow on the steep hillsides. For a while, chestnuts became the main product in this city. But the crisis was happened when Japan began to import cheaper chestunuts from Korea. It seemed this small village’s worries would never run out. Then one day, an idea from the city chief changed this city’s fate and Yamamoto’s life. “The chief of the village suggested that we use chestnut for shōchū to support this village,” he explained. Making chestnut shōchū is a complicated thing with many qualifications. He knew it would not be easy, but he decided to make chestnut shōchū. One of the big reasons was that many people who live in this area got behind Mutemuka. When he decided, he found out one simple definition of sake of local brew. “You know, I should make Dabada for this city and local people who supported me. Then, if we advertise Dabada as real sake of local brew, it should make by all local things. I mean not only ingredient, but also people. That’s a real local brew, isn’t it?” he said. So he hired all local people, and used all local ingredients. Dabada was totally nameless shōchū at first. Chestnut syochu producted in Kyusyu area was more famous at that time. It seemd difficult condition for small city to support using only chestnut syochu. But he had confidence of Dabada would definitely become popular. The evidence of his confidence was so simple and kind a unique. His words are simple logic, but in this era, sometimes so many unique products attract people just temporarily. So his words were very impressive for me. When he marketed his product, most of big store declined Dabada, but some small stores accepted. He continued steady marketing for a long time. “After all, it took for 25 years to become popular,” he said. He realized Dabada’s demand increased gradually. At that time, big companies asked him that they want to buy Dabada. People also realized that Dabada isn’t only tasty, but also scarcity value because only produced in Shimanto with local ingredients. Then so many people really want Dabada. But he has never changed his simple opinion and humble attitude. Mutemuka sells about two hundred thousand bottles of Dabada per a year. (Sometimes it depends on the harvest. Last year, they couldn’t harvest chestnut very much.) Demand is more than supply, so Dabada is really hard to get nowadays even online. There are substantial numbers of people are waiting. He made an appreciation alcohol for only local people. Inside is Dabada, but the price is cheaper than usual one. He contrives to make low cost, for example use small label and bottle which vary from the distribution. “If local people don’t drink Dabada, I couldn’t call Dabada as a local brew. Thanks to local people’s help, Dabada could be famous, and in turn, support this city. I have to repay them,” he said. From his words, I could feel a genuine appreciation for local people, and honest attitude. This company’s policy is “Don’t forget the original intention. Be simple. 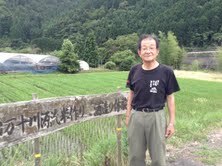 Always keep honest attitude and produce sake using local natural ingredients.” He is the very person to keep this policy. In this way, Dabada has made a large contribution to the city. By the way, the terms shōchū and sake are commonly used to describe different traditional Japanese drinks. Japanese traditional alcohol is brewed to obtain the proper flavor. Jomai (蒸米–”steamed rice”) and water are fermented using koji (麹– a kind of yeast prepared from rice or barley). This produces an unrefined sake, known as nigorizake. After filtration, this becomes the standard Japanese traditional sake. There are two main classifications of shōchū: shōchū-ko (焼酎甲類–”high class shōchū”) and shōchū-otsu (焼酎乙類–”low class shōchū”). Shōchū-ko is distilled from the unrefined nigorizake. 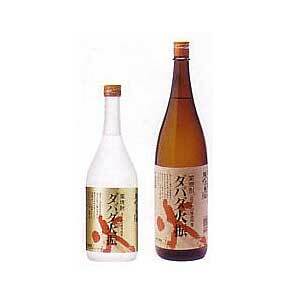 Shōchū-ostu is higher in alcohol content and is produced using honey as a raw materia. Dabada is a kind of shōchū-otsu. Can you guess what kind of taste? Most of shōchū use wheat or potato. Dabada is not just chestnut shōchū. It’s 50% chestnut using only local chestnuts. Instead of the standard shōchū yeast, it uses an original seisyu ferment (清酒酵母). It is produced from a local pesticide-free rice base in the primary charge, and then added a lot of chestnuts for the secondary preparation. After that, it is distilled slowly and at low temperatures. Sweetness and smell of chestnut made by this procedure. It’s so easy to drink for everybody even if you are not good at drinking shōchū. ”Everybody says it’s incredible to come up with that idea. But I was just in the situation that forced me to come up with something for my company, tasty alcohol, and this city,” he said humbly. President Yamamoto made interesting system for fans of Dabada in 1992, “Shimanto Mysterious Reserve.” Dabada’s unprocessed sake is put in 18L original Mino burned bottle (美濃焼き瓶),raise owner from all over Japan, stock in a tunnel in Shimanto for 1667days (4 years and 7 months) for only 500 people per year, and ship it for the owner. The bottle is engraved buyer’s name. It’s so popular and year by year, and buyer’s are increasing. The reason why is not only Dabada’s taste, but also it’s unique character. The company is in Shimanto city (四万十), there is a Shimanto river (四万十 川), mysterious reserve’s price is 40010 yen (四万十 円) and savings time is for 40010 hours (四万十 時間). He unifies 四万十 for mysterious reserve. 四万十means 40010 in Japanese. Moreover, customers have to wait for a long time, it makes Dabada more tasty when they get it. It is so romantic idea, isn’t it? At last, I asked him about bear story. He answered “It’s totally made-up story by comic.” He laughed. I believed this for a long time, so a little bit shocked. But maybe nobody has tried that yet and I’m sure that the bear is willing to drink like the story because it’s really tasty and easy to drink for everybody. Moreover, if I’d never read this story, Dabada would never have remained in the mind of a junior high school girl who lived in another prefecture. I realized Dabada is hard work because of marketing and making. Bur bear story is so interesting. When I smelled Dabada, I thought this is like chocolate!!! Actually I have never drunk Dabada Hiburi. I should try. From this article, Dabada Hiburi made from all local ingredient. It was surprised me. We should take over this method to the future.